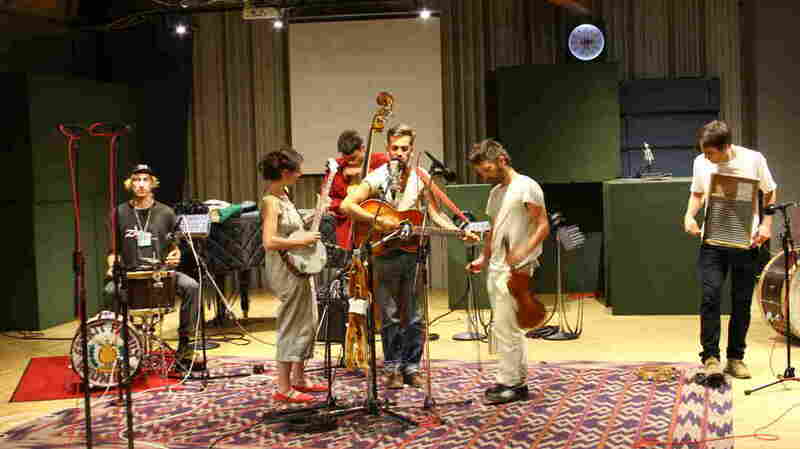 Spirit Family Reunion: Music For Church Basements The Brooklyn-based Americana band discusses it's rough-and-ready approach to touring and recording, and performs live at NPR. Spirit Family Reunion performs at NPR's headquarters in Washington, D.C.
"When My Name Is Spoken"
"I Want to Be Relieved"
It's summer. It's hot. And that means it's time for a particular kind of music: the kind that streams from church basements and empty lots, raising your spirit as high as the mercury. It's revival season. Spirit Family Reunion isn't from Appalachia or the plains; the band is from Brooklyn. Its music, though clearly Americana-based, casts a wide enough net to elude classification. "We don't really have a definition for it," says guitarist Nick Panken. "A lot of people call us a bluegrass band, which is false. Some people call us an old-time band, which is also false. But we definitely are very inspired and take a lot from those traditional bands." "I think a lot of what we try to do is provide the spirit of gospel music without being a particular faith or excluding any faith," adds fiddle player Mat Davidson. "Open-door gospel, I guess." Panken and Davidson are joined in Spirit Family Reunion by drummer Peter Pezzimenti, bassist Ken Woodward, banjo player Maggie Carson and washbord player Stephen Weinheimer. The six members travel the country in a beat-up Chevy conversion van, along with their instruments. Though they're unsigned, they are still making their way to the stages of some major music festivals — including the Newport Folk Festival, where they played this weekend. But before they did, Spirit Family Reunion stopped by NPR to chat with David Greene and perform some songs from their new album, No Separation.